On March 24, 2009 Project Tomorrow released selected national findings from the Speak Up National Research Project at a Congressional Briefing sponsored by Reps. Judy Biggert, Ruben Hinojosa, Mark Kirk, Dennis Rehberg, Mike Ross, and Lucille Roybal-Allard. Speak Up 2008 represents the voices of more than 281,000 K–12 students from schools and communities in all 50 states; their ideas provide unique insights into how we can invest the historic ;stimulus funds in our schools to create our next generation of innovators, leaders and engaged citizens. Over 160 people attended the Congressional Briefing; including congressional staff members, student, teacher and principal representatives from some of our Speak Up schools, members of Project Tomorrow’s board of directors, and staff from many of our sponsors, champion outreach partners and non-profit partners. We were also pleased to welcome staff from the American Youth Policy Forum, Association for Supervision and Curriculum, Building Engineering and Science Talent (BEST), Center for Education Reform, Center for Implementing Technology in Education, Coalition for Community Schools, DC Children Youth Investment Trust Corporation, Education Free Agent LLC, Education Sector, Goddard Space Flight Center, Joan Ganz Cooney Center at Sesame Workshop, KC Distance Learning, Learning Point Associates, MD State Dept of Education, National Association of Secondary School Principals, National Cyber Security Alliance, National Cyber Security Division-U.S. Department of Homeland Security, National Museum of National History, National Science Digital Library-Resource Center, National Science Foundation, National Science Resources Center-Smithsonian Institution/National Academies, NCES-U.S. Department of Education, NY State Education Department, Office of Innovation and Improvement U.S. Department of Education, SAS Institute, Inc. SIF Association, Smithsonian Institution, National Museum of American History, Spackenkill School District, Strategic Engagements, Tiger Woods Learning Center, U.S. Department of Education, Office of Educational Technology, and Washington Partners, LLC. Julie Evans, CEO - Project Tomorrow; Kathy Bihr, Vice President and Executive Director - Tiger Woods Learning Center Foundation; and Chris Rother, Group Vice President from CDW Government, Inc. welcomed the participants to the briefing and shared their enthusiasm for the Speak Up 2008 findings. Representative Dennis Rehberg (R-MT) and Laura Abshire, Legislative Director from Rep. Mike Ross's office shared their views on the importance of using the Speak Up data to inform decision related to the one-time stimulus funding. 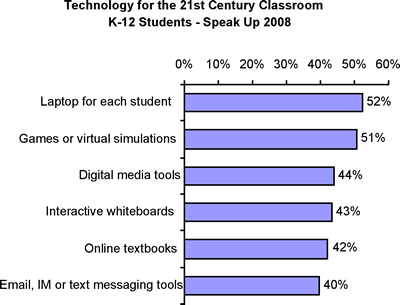 Learning & Teaching with Technology. Julie shared selected national findings from Speak Up 2008 and discussed the importance of listening to our students – the Digital Advance Team - as administrators, principals and teachers think about ways to leverage the stimulus funding in their school districts to create 21st century classrooms and improve student achievement. How would students use the stimulus funding to create their ultimate school? To learn more, check out the national findings. Students from Digital Harbor High School (MD) Forest Park High School (MD), Our Lady of Mercy College (Australia) and Perry Hall High School (MD) shared their insights about their technology use in and out of school. Their views were echoed by over 150,000 students who shared their specific ideas for improving their education during Speak Up 2008. Some of these comments can be heard in Project Tomorrow’s newly released video: Students ‘Speak Up’.